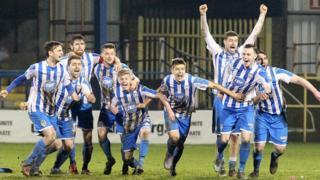 Coleraine fight back from two goals down to earn a penalty shoot-out victory over Ballinamallard in the Irish Cup fifth round. Ryan Campbell and Adam Lecky struck in the first half to put the Fermanagh visitors in control. Steven Douglas pulled one back on 85 minutes and Ruairi Harkin levelled in stoppage time before Oran Kearney's side prevailed 4-2 on penalties.